After several experimenting and testing of various iOS 9.2 betas, the full and final iOS 9.2 Firmware (Build: 13C75) is now officially available for update / upgrade / installation on iPhone 6S Plus, iPhone 6S, iPhone 6 Plus, iPhone 6, iPhone 5S, iPhone 5C, iPhone 5, iPhone 4S, iPod Touch 6, iPod Touch 5, iPad Pro, iPad Air 2, iPad Air, iPad 4, iPad 3, iPad 2, iPad Mini 4, iPad Mini 3, iPad Mini 2 and iPad Mini devices. The official Direct Download Links of iOS 9.2 .IPSW Firmware Update Files are also available below from Apple. Apple has also released other firmware and software updates as final version for other iPhone, iPad and iPod Touch utilities and tools, such as; Xcode 7.2 (Build: 7C68) compatible with OS X Yosemite v10.10.5+ and OS X El Capitan v10.11+ or latest, Apple tvOS 9.1 (Build: 13U85) for Apple TV 4th Generation (excluding Apple TV 3G), and Apple watchOS 2.1 (Build: 13S661) for Apple Watch Sport, Apple Watch, Apple Watch Edition, and Apple Watch Hermes. The latest iOS 9.2 Update supports new functionalities, improvements, fixes and performance enhancements in terms of hardware and software. Full iOS 9.2 Changelog can be read in below image. The newest version of Xcode 7.2 includes; iOS 9.2 SDK, tvOS 9.1 SDK, watchOS 2.1 SDK, OS X El Capitan 10.11.2 SDK and support for Swift 2.1.1. Apple has already patched several exploits and codes required to further Untethered Jailbreak iOS 9.2 with PanGu, TaiG or 25PP Jailbreak Tools. This means currently, iOS 9.2 Jailbreak is impossible. 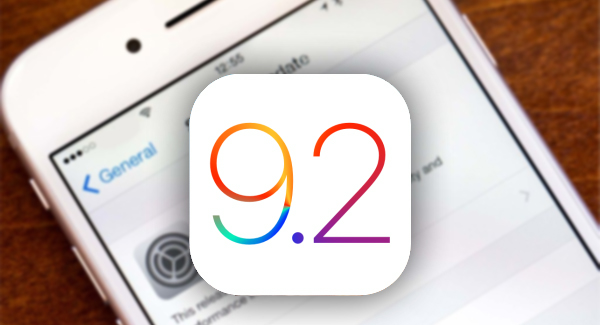 How to Manually Install iOS 9.2 Firmware? The official iOS 9.2 OTA Update is available through Settings > General > Software Update option. For watchOS 2.1 OTA Update, iOS users need to open companion Apple's Watch Application on any iPhone, iPad and iPod Touch device, and then navigate to My Watch > General > Software Update. You can also Download iOS 9.2 Final Version .IPSW Files for Manual Installation with iTunes.